The Journey Begins: An Interview with YPA exhibiting photographers, Allaire Bartel, Leah Schonauer and Mariah Wild. Last week in New York City, the Young Photographers Alliance (YPA) showcased their annual mentoring exhibition, which was a compilation of photo essays from 11 teams across the United States, Canada and England. 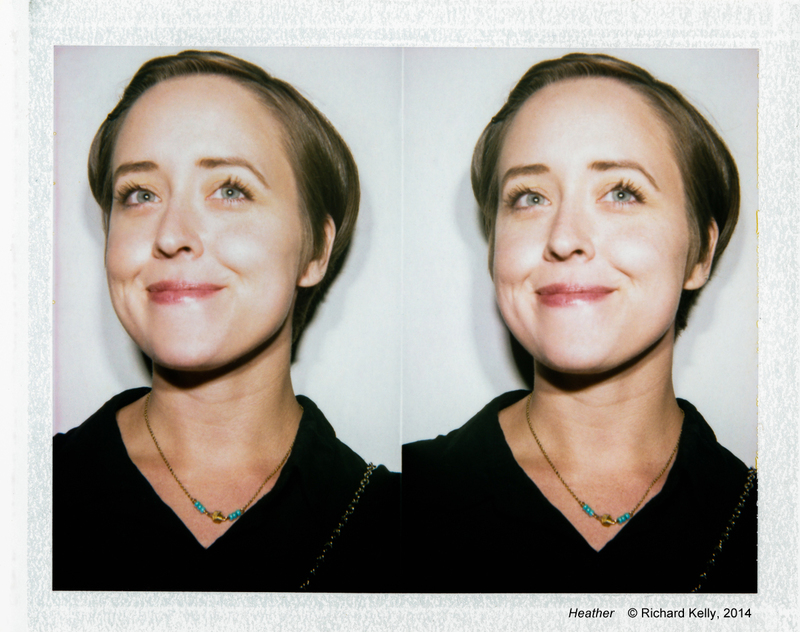 Our Pittsburgh team was composed of up-and-coming photographers Allaire Bartel, Leah Schonauer and Mariah Wild. All three of these women tackled the project’s theme, Boundaries, with poignancy and provocation; showcasing final images which revealed as much about their process throughout this project as they did about the end result of challenging us to reach beyond what we think is set. I had the privilege to sit down with Allaire, Leah & Mariah, after the summer mentoring program came to a close and their work was exhibited locally. We talked about the YPA program, the Boundaries endeavor and their thoughts on photography. These energetic, ambitious women easily reminded me of the course of laying down roots in photography: nurturing growth and allowing your photographic vision take hold of you and blossom. Boundaries is one theme, but you offer three very individualized projects. How did you hear about the YPA opportunity in Pittsburgh and what led you to apply? LEAH: For me, I heard about it from Jon Lisbon, he was my teacher for a lot of classes the quarter that I applied. It was just one of those gut feelings that was, “I need to apply for this”. So I did and it worked out. MARIAH: It’s kind of similar, I saw a flyer at school on a bulletin board and then I went online and looked at it. I really liked what it was about and went out on a limb and applied. ALLAIRE: I got an email about it. I had done the project in a previous year so they just send me emails. Tell me about your personal interpretation of the theme, Boundaries. When you heard the theme, what element of the word ‘boundaries’ struck a chord and led you to pursue this? LEAH: The first thing that popped in my head was imagination. I work a lot with composites so I really wanted to make this huge thing that was all about imagination; it could be this little dream world kind of project. So that’s what drew me to it. I guess rather than having the boundaries, it would be breaking the boundaries. MARIAH: I’m always kind of a stubborn person, so I instantly was drawn to people telling me what you can’t do. My first instinct was to go towards things that people think you can’t do or shouldn’t do, and I went from there in terms of age and what not. You contemplate the concept of boundaries in your individual ways and then, of course, you each approach it a little differently. Walk me through your process of making a project. Where did you decide to start, how did you decide to find subjects and plan it all out? LEAH: Mine started off kind of trial and error. I wasn’t really sure how to go about shooting this still, small-scale, background photo because mostly I shoot on location and just on a bigger scale of course. So, it was getting used to that and then I wanted to use older people for multiple reasons. One was because it went more with my theme of representing wisdom, people trying to fix things for others from what they’ve learned, so the wisdom. And then also, it helped because I don’t have a lot of older people in my portfolio as of now, well, as of then. It worked hand-in-hand that I could get out there and include more people, and people I know that were in a different age range. It all fell together so nicely, it worked. MARIAH: I don’t want to say my project was completely different, but I always had this idea of elderly people in these elaborate setups. And, I’m a pretty shy person, so I met everyone through family members and it was out of my comfort range. But, once these people invited me into their homes, it suddenly seemed (pause) it didn’t seem right I guess, to put on this big spectacle of a photograph when they were opening up their home to me, being polite and gracious. And, I wanted to capture that, them as a person as opposed to what I originally thought they should be. It changed the whole thing when I’d go in and talk with these people and there was a lot more. It was almost more about talking with these people than the photographs themselves, because I wouldn’t have done that prior. So, I went in and talked with them and ended up photographing based on the misconceptions that people have about older adults. That at a certain age, they aren’t relevant anymore in our society. Suddenly, we don’t think they should be going out and doing things. I wanted to show that these were still people. They’ve had experiences, they still do things, and t hey shouldn’t be writtenoff, just because you’ve aged. Everyone’s going to age at some point so (pause) you might as well embrace these people because you’re going to be one of them! (laughter) It was a really good experience just personally and then photographically it was different than what I normally do. 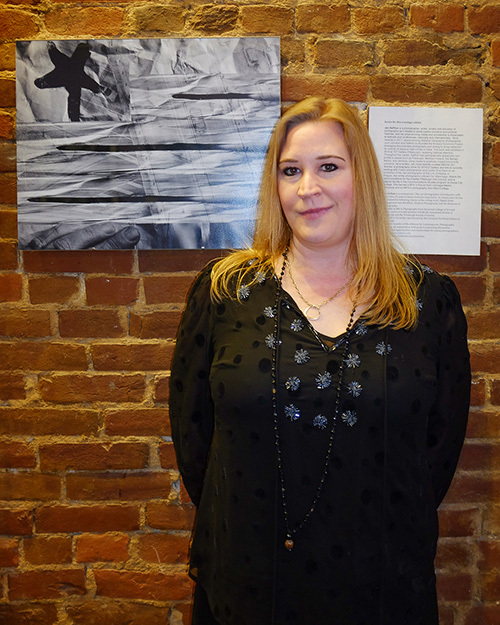 Although it is personal, you have mentors alongside of you at various stages [Pittsburgh’s mentoring professional photographers were Brian Kaldorf, Jon Lisbon, Laura Petrilla & PR/marketing consultant Jen Saffron]. Did you find that you were often re-evaluating and adapting? LEAH: I think I definitely had an idea of what I wanted it to be, but having the mentors, and Mariah and Allaire, throwing out things to think about in a different perspective really helped to bring my whole project together. Even seeing each other’s projects, it motivated me to really do the best that I could and make something that means something, not just to do photos. All of these projects have to do with portraiture, which can have a lot of emotional, behavioral and psychological elements to it. I’m very curious how you felt as the photographer, having to create that relationship with your subjects? LEAH: I think the best part and I don’t want to sound cliché about it, but it really is hard to get to know somebody in a short amount of time and take their picture and represent who they are. But, it’s really fun – you can see so much just from having a short conversation and taking their picture. Sometimes it gets so comfortable that you can do that. And, I think like I said, it may sound cliché, but that’s what I enjoy about it. It’s hard. I’ve come a long way from this and from school and everything, but being able to do things or say things that can really make them feel comfortable and you can get at who they are, rather than, like Mariah said, who you want them to be in your photo. ALLAIRE: It’s definitely tough, especially for mine. If I wasn’t working with my friends I don’t know if I could have pulled off the photos in the same way because not only in some of them she’s being physically restrained, so that’s painful for her, or she’s contorting into a weird position, but the male model is also contorting into a weird position to hide out of the frame. So, first of all it’s really physically demanding, and they’re doing things that aren’t natural and aren’t comfortable. On top of that, I have my really close female friend, who we bonded and created this project over our emotional experiences, and I’m asking her to re-create and re-live those experiences. Then, at the same time, I’m looking for the right shot and I don’t want to stress them out further, so every shoot was really emotionally charged. They were physically uncomfortable, but really willing to power through. My models are awesome. Then, I’m trying to keep it together and communicate without stressing anyone out anymore. So, it was tough but ultimately worth it, I think. I think that’s what you said, the best part about working with people is when you see that moment and you finally get something out of somebody that is perfect, you know. MARIAH: I agree. Probably the best part is being able to capture the subtleties in people that they may not notice, because most people don’t like portraits of themselves so it’s hard. I don’t want to say that it’s how they see themselves, because it’s how I see them when I photograph them, but it’s opening their eyes to things that they may not have noticed before. For example, one of my subjects was my grandmother and I had people come up to me that knew her and they’re like “I’ve seen that look on her face a thousand times, but you’ve captured it, you’ve just captured that moment.” That’s a huge rewarding thing. I mean obviously you can’t completely embody a person in a photograph, but you can get a good sense of who they are as a person in the photograph. You want that to be conveyed. It’s really a special feeling when people approach you and are “I can relate with that person” or “I want to know that person.” I kept travelling back home in New York to do this. I would generally bring a family member, someone who’s more social, and initially I’d keep my camera down for a little bit, especially if I wasn’t familiar with them at first. And then, I would just talk to them, almost like a distraction technique. I’d just have to talk and socialize and eventually they’d forget I was there or when they would include me in conversation, they didn’t mind the fact that suddenly I had picked up a camera because we were already talking and sharing all the experiences. I wouldn’t say it was a slow process, but there was definitely respect. A mutual respect, where I’m going to wait and then we’ll go from there. It was fun. Let’s talk technical. What equipment did each of you use, and explain your post-production? ALLAIRE: I have a Canon 60D and it is a crop-sensor, so that’s unfortunate, but the lens that I used for this project was 55-135, also a Canon lens. I like it because it focuses really fast and really silently. And, it has a very smooth fall-off, a very smooth background. It’s a nice portrait lens, it’s flattering, at the 55 setting especially. Additionally, I have a Bowens kit. I have two strobes and a couple of umbrellas and that was what I used. Most of the shoots were indoors. For the one that was outside, I have a Canon flash and I just used that. Some of them I gelled, like the kitchen shoot. I gelled the light to make it a little more orang-y, so that it was implying that it was morning. And then for the outdoor shoot, the one in the Strip District, the lights overhead were very weird, they were like yellowy-green-orange and there were a lot of different ones. But, they had a really nice mood, they set this sort of creepy industrial mood, so I wanted to include them and I left those in by gelling the flash to match that a little bit so I could balance it later. But, nothing crazy fancy, just one or two lights per shoot and my little camera and little lens. MARIAH: I have a 5D mark III and I shot with a 50mm. Everything worked out in that sense, as I didn’t want to come in with all of my stuff. I feel like it would have taken away from the conversation. Definitely if I’m lugging in all of these lights and setting up, then they are instantly uncomfortable. You also had to be very aware of your surroundings as far as windows and everything else, because I hadn’t been at these places previously. As far as post-production and coloring, it kind of worked itself out. There were reoccurring themes and colors that I didn’t even notice prior, until I started laying them out that worked out really nicely. It just fell into place with very minimal post work. LEAH: I use a Canon 6D. My lighting setups, they were very different. It just depended on where we were meeting and how it was easiest to light or what would suit the photo best. So, I had a combination of just being in the shade, I have an Alien B that I used a soft-box with for one, or I used a huge window. For this one, I met the one older gentleman, he works at this thrift store, he’s so cute, and there’s this giant window and we just did a photo right in the middle of the store. And, on another one, it was just a ceiling light. It was all different. I usually don’t set up backgrounds. It’s more convenient just setting up that I don’t have to lug a huge background around and also it does make them more comfortable. I know all the models that I have, and I think it makes them more relaxed. More enjoyable. It all came together. ALLAIRE: You’re really good at cutting people out of backgrounds, and it’s not apparent that they weren’t on solid backgrounds. You have a skill there; you’re just good at it. LEAH: I think a lot of it is, whenever I take a photo, I can see it edited. Sometimes I don’t realize how much work it’s going to take to get that way, but I know I can make it look like that. It’s knowing that I can see the potential. I want to talk about the YPA program and hear your thoughts about the mentors/mentee relationship, which you formed with the other people involved. What value did you find in this program? Did it meet your expectations? MARIAH: It was definitely different. It was a great experience because it’s feedback from professionals in the industry that you wouldn’t necessarily get. It was incredibly rewarding. But, at the same time, it could be really frustrating because you have this vision and then you have three people, that aren’t seeing what you’re going through, so they see exactly what you’re showing them. They’re not on the shoot with you and in that aspect they could be tough critics. It’s frustrating to convey how much time and effort you’re putting into it because you’re just bringing in your work every week. So, it was really helpful and it was great to get feedback as you’re going, it’s just that sometimes you had to stand your ground and know what you wanted to do. Which is important and good to learn too. It’s not like a class assignment, now, this is your work. It was a good transition, especially from student to professional, because you’re still in that student mindset initially where you’re looking for approval. But, what you’d want out of this, in reality, is exactly what you’re trying to accomplish and they’re there to help you. So it’s good in that aspect. ALLAIRE: I think we all had that. I felt a sense of that at a certain point. I think there was an aspect of standing your ground. Also, I mentioned earlier that I did this program in 2010 when it was brand new, and I worked with another mentor. Going through the process was really helpful to me to have someone to talk to and to get feedback and to vent even about transitioning to living in Pittsburgh, and all of those things. And this year, I liked the theme so I applied again and I was almost hoping for the same thing, even though I’m a couple of years older and wiser. I wanted guidance and I wanted to feel more creative and to move forward. I think the program is really good for that. I don’t think my project would have gone as far as it had if I hadn’t had the people to bounce ideas off of. Although it could be frustrating, I think it was really good and I probably would have settled for something less if I didn’t have a lot of peoples’ opinions and other people pushing me. ALLAIRE: Also, I think the YPA is a volunteer organization, and I think they had some issues with general organization. They didn’t have much of a social media push, and they’re a little bit like flaky on the dates when things are going to be, but I would 100% recommend the program, if they get some of that organizational stuff together because twice in a row it has helped me out a lot, as a person and as a photographer. As a photographer, you have to build your own community of people who are consistently willing to be a resource for one another. I’m wondering if that is another outcome of this program. Have you made a connection with one or more of the four mentors involved? MARIAH: It almost put you on the same level. Not the same [photographic] level, but I mean in dealing with people. It’s almost like putting you as a peer with them. So, they’re not some all-knowing person that you wouldn’t approach. You’ve talked with them, you sat down, you’ve bounced ideas off of them, and you feel more comfortable approaching someone who’s clearly been in the industry longer. Now you can connect with them more. What are your thoughts about opportunities in Pittsburgh for young up-and-coming photographers? Is Pittsburgh a hospitable environment for a new artist? LEAH: I think no matter where you are, if you know what you want to do, you can make it work, no matter what is already there. I think in Pittsburgh there are different opportunities, but I also think there are opportunities everywhere. Whether that is in a small town that you can start something in, or a huge city. I think if you know what you want to do and you know how to do that, you will make it work, if you want to. ALLAIRE: I’m planning on moving to New York, which is a much bigger city. Part of the reason is I think there are more opportunities in a large city. That isn’t to say there aren’t opportunities in Pittsburgh, but like she said, I could make Pittsburgh work for me if I really wanted to and I knew exactly what I wanted. But, I don’t. So, right now I think I need a broader net and a larger city has the broader net. MARIAH: I think there’s plenty of opportunity if you’re going out and seeking it. A lot of people think it’s going to fall on their lap, but you have to actively go out and seek it, which I know is difficult at times. You see a lot of photographers, especially young ones, who are so caught up in their work or their school or their job that they forget about the importance of personal projects and what not. I’d kind of like to see more photographers expanding on that in Pittsburgh, especially the younger ones. ALLAIRE: I think in Pittsburgh too, being a college city with the Art Institute, Point Park, Carnegie Mellon, Pitt, you get a lot of young people that graduate and there are a lot of markets in Pittsburgh that are over-saturated. Photography may or may not be one of them, but when you just have young people looking for opportunities in such like a college-centric town, it’s a hard fight, I think. In Pittsburgh, you had an early opportunity to show your Boundaries work to other people at a gallery show [co-hosted by The Alliance for Contemporary Photographic Learning and Camera Arts Creative], which can be a beautiful way of finding closure with something you’ve worked so hard on. I’m curious, was there a moment of transformation for you when you saw these final pieces up? Did the images hanging on the wall make your work come alive in a different way? ALLAIRE: We started hanging and we had to rearrange things and then we discovered that the color worked really well with yours (to Mariah), and yours (to Leah) looked really good against the brick wall, it really came together in that studio. There were really different bodies of work, but the show worked well. I didn’t feel a sense of closure when I sent things out to print because I was still stressed that they weren’t going to come in on time. (laughing) It might just be me, but it needed to be ready to go for me to feel calm about it. And even the day of, do you guys remember it was like ‘I’m afraid no one’s going to come’? MARIAH: Yes, that was probably the biggest thing, more so than hanging on the walls. When it was us hanging, it was still us three in the space we’d been at all summer, so it was kind of like “Okay, we did it. Cool. It’s finished.” But then, the day of, when you’re sitting and thinking “Oh my Gosh, no one’s going to come! It’s going to be a room of empty people who’ll be staring awkwardly!” So, the biggest moment was seeing the room packed full of people looking at your stuff and actually talking about it. It was mind blowing. Wow, we did it. We did it. We finished! LEAH: I agree with you guys. The weekend before, because my dad built my frames and I printed them myself, I had so much to do. And after all this work, you don’t really think of how big it is I guess. So, I think when it finally hit me that it was real was whenever people were coming. It was one of those things that mad you think, “This is set up perfect. This is how it’s supposed to be.” It was to a T much better than I thought it would be. It was incredible, it was awesome! It was awesome; it was a great night and inspiring. So, let me ask about inspiration: where do you draw your inspiration from? LEAH: A lot of mine is movies. I wish I had more time to watch them, but actually all my photos, it’s almost like when the twist and the plot are revealed in the movie. That’s what I love about movies and music and everything and that’s where I get a lot of my inspiration. That, and photographers that do composites and dramatic work, like I try to do. The ultimate one that stands out in my mind that really, really inspired me to start compositing was and is Erik Almas. He is amazing and he even has on his website that it just fell onto his lap. I mean, he puts so much work into it and he’s amazing. He’s so good at it that I don’t think this guy is real! ALLAIRE: It’s beautiful. It’s just a fantasy world! LEAH: Yeah, and that’s it exactly. I love making that, that little imagination world. MARIAH: My inspiration is definitely movies and books. I was a huge, avid reader when little, so I’m very big on the story-telling base. I’ve noticed I always tend to gravitate towards story-based themes, more conceptual things based on personal experience. Even lyrics and music and movie plotlines are definitely like story-telling, that’s why my project ended up being more like these people’s stories. ALLAIRE: I think visually I pull a lot from paintings and graphics. I think my work is illustrated, but in a more abstract way and so I don’t always look at other photographers. Sometimes I just look at paintings, and I love watercolors and that kind of thing. And then, I think the other half of that is, most of my work is portraiture, it’s the people themselves. Sometimes you have an idea and you just find a model for that. But, other times, I’m so creepy because I’ll just walk down the street or sit in a bus and I’ll be staring at somebody and I’m thinking I want to take their picture. I haven’t got up the courage to approach strangers yet, but I definitely just like to stare at people. I find them interesting, visually. Think about what you don’t know yet in photography. What is one thing that you still want to work on or you still want to learn? LEAH: How to edit without all the hours. ALLAIRE: Streamlining that process. I can agree with that. MARIAH: Approaching people and getting their story would be incredibly helpful in my situation. ALLAIRE: I think what I really need to do is streamline my portfolio. I’ve had a food photography job for about a year now, which has nothing to do with any of my personal work. And, I do graphic design for a music production company, which has nothing to do with my personal work. So, I would like to decide on something and then become better at it and grow with that. I’m a little too ADD with my portfolio right now, and I need to streamline it a little bit. Since we are in Pittsburgh, where is your favorite local place to go and make photos? LEAH: I don’t have a specific place, just somewhere in nature. Not necessarily a woods scene, but I just love outside light. MARIAH: Actually, I haven’t shot there but I’ve always been meaning to down in the Strip District. There’s a ton of places there to photograph. If you were not out photographing, where would I find you? ALLAIRE: Working in a restaurant. You’ll find me waiting tables. MARIAH: I work with a lot of bands, so I’d probably be with a band somewhere. LEAH: If I’m not doing photos, I’m probably editing the ones that I haven’t. I love editing, sometimes more than taking a photo. So, that’s usually where I’m at, my computer. What’s your favorite piece of photographic equipment? ALLAIRE: Can I be really awful here and just say that I really like natural light, because it makes life so much easier. Morning light, golden. Yeah, I love not pulling out equipment, actually. MARIAH: That’s beautiful. That, and one reflector. Do you have a favorite focal length? ALLAIRE: I shoot 50mm a lot, but I’ve been weirdly wanting to use a wider-angle lens recently. I’m getting an urge for some reason and I don’t have a good one. So it’s on my purchase list. LEAH: I’d say 50mm is probably my go-to, I use it predominantly. But I geek really hard over a 70-200, 2.8. I don’t have one yet, but it’s going to happen and I’m gonna love it dearly! What is your favorite photography-related website or blog? ALLAIRE: Peta Pixel. I’m on Peta pixel all the time, just looking at random projects and they have tutorials too, sometimes. LEAH: 100% Phlearn. Phlearn is like Netflix to me. It’s amazing. They have tutorials, photo tutorials, they have everything. MARIAH: I’ll admit, recently I’ve been getting into pinterest. It’s not necessarily photography, but there’s just a lot of interesting things on there so I’m like “Hmmm, I could get on board with this”. I need to know where you would go out to eat, since I love food. What is your favorite Pittsburgh restaurant? LEAH: I don’t go out to eat a lot, but I’ve got to say Noodles and Company is so good. And I went to a seafood place in the Strip District, I don’t remember the name, but it was amazing. MARIAH: I’d say this is the nostalgia aspect more so, but my family, every time they come in to town, we end up going to the Spaghetti Warehouse. Every time, every time. It’s just non-stop. ALLAIRE: I work in restaurants and I work right now at Tamari and Grit-n-Grace, and I wouldn’t work there if I didn’t love the food. So those are good ones. But, I’ve also worked at Eleven, which has great food. Grit- n-Grace has the same owner as Spoon and BRGR, and I went to Spoon recently with my friends and that was our destination outing. It’s amazing. There are so many, so many good restaurants in Pittsburgh. One last question, if you could inspire someone else to follow his or her pursuit of photography, what advice would you give? ALLAIRE: Well, no, that’s not true. I do think what I would say is, we’ve all been through The Art Institute. When I was there, it was a couple of years ago and there was a really big transitioning happen, from film to digital. Classes were being dropped and created, and a lot of classes were redundant. What ended up happening was, I feel like I spent a lot of money on it and there were points in time in my education that were very stagnant and the classes weren’t teaching me anything. I’m not saying that I regret going to school and I learned a lot at The Art Institute. But, if there were someone new, I’d say, maybe don’t take the traditional education first. You can learn similar things online or through apprenticeships and that kind of thing. And maybe take that and save yourself some money. LEAH: There’s a lot to say. I think the main thing is I feel like so many people, from my friends and my roommates or past roommates, some of them went to school just because they felt they had to. And it was just a last minute decision, like “I’m just going to go for photo”. I know that a lot of people don’t think it’s a lot of work, but it’s a lot of dang work! And, I think that it’s for the people who know that they want to do photography, or it just resonates with them. It’s just something that they’ve always wanted to do, they don’t necessarily know why, but you do know in the back of your mind. From my experience, I’ve learned so much from going to school, not necessarily from just the classes, but being around other people and getting to know the people and realizing what I’m doing. And, I am finally coming around that I know what I like in a photo. I know that sounds simple, but I know what I want to see when I do a photo, and I know what I’m looking for and I think sometimes people get really caught up in being told by teachers or just other students “you really should just do this”. They get so caught up in the technical, that it’s like you’re missing out on what photography is. It’s creative, it’s fun, it’s art. You’re limitless with what you can do and whenever you get caught up in “ooh, this light is a little bright here” it’s like you’re missing the whole point of what’s beautiful about the photo. ALLAIRE: I just remembered, when I was in school and I was getting into my final classes and after all of the curriculum changing, after those people who just choose something at the last minute and realized it’s a lot of dang work and they dropped out, you know, I ended up graduating with a solid class of really talented photographers. People would say, “what are the artists you admire most?” And I’m like “it’s the people I’m graduating with because they have really individual styles and they’ve got it down at this point”. That part was a really amazing, an awesome part of going through the school system and being around creative people all the time. Are you going to stick with it? Sitting down for an impressive latte at the South Side’s Big Dog Coffee (if you haven’t been, the intelligentsia coffee is worth the trip! ), I had the pleasure of talking with Richard Kelly about his life in photography and his recent best-in-show win at our juried show Sides Unseen: Unique Portraiture. 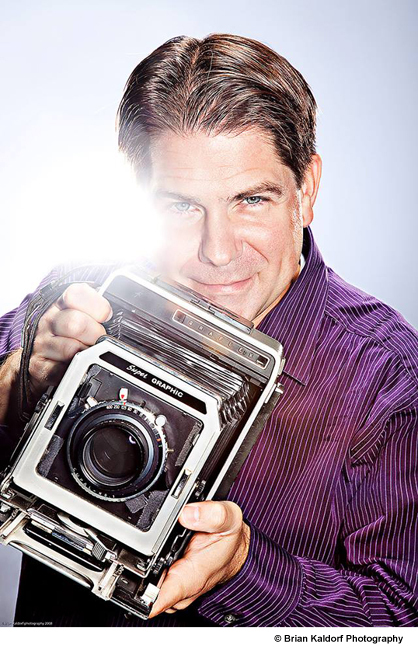 You likely recognize Richard as a current industry leader, a business and copyright expert, and an ardent photographic educator and lecturer. The journey began when Richard cultivated his own path at the young age of 11. When his parents denied him a camera, he cut grass and worked a paper route to earn enough money to purchase his own, a Pentax 35mm SLR. As Richard explained “I was able to buy a camera and got my first paid job right away.” The spark ignited a fire and he continued to pursue photography throughout his teen years, picking up paid jobs and learning from older friends who allowed him to come along on photographic outings. Once he moved to New York City, he assisted for photographic giants Art Kane and Norman Mauskopf, among others. He landed his first independent photography job for a national magazine in 1988. Through the generous support of mentoring friends, he was able to utilize studios and equipment to take his career to the next level. Pittsburgh has been lucky to have Richard as a leader in visual communications since 1993 and his early experiences have provided Richard the impetus to routinely embrace the beneficial role of educating and mentoring others, as a way to give back and to continually learn himself. As motivation he indicated what he is searching for is “the end of learning”, fully aware that one doesn’t ever stop. When we began discussing the recent exhibition Sides Unseen: Unique Portraiture, which included pieces from his passport portraits series, there was a palpable energy shift. It’s clear the photograph and the people that he works with are at the very heart of what he does. Intuitively, he took this camera to the last day of his class, and limited the exposures to two per subject. He then scanned them to apply basic Lightroom adjustments and, if necessary, edited further in Photoshop, spotting the main subject area or adjusting film inconsistencies, which can be a common discrepancy with this type of Polaroid film. He planned to give each subject one of the two exposures and keep one for himself. His winning photograph Heather pushes the portraiture medium by playing on our visual senses. The images appear to be identical, yet they are definitely, subtly, different. As Richard explains, “There is an intriguing quality about the two images side by side. They are of the exact same moment in time and yet there is something different about them.” He is excited to explore this area further, investigating the philosophical question of time and how you can slice one moment of it with photography, and yield different results in the same instant. That’s solid advice to any photographer. I’m excited to see what viewpoint he introduces next, fully aware that, with Richard, I need only to ask. His reciprocal commitment to educating, mentoring and inspiring others is a true enrichment to our local photographic community. Go to lens: Canon 85mm 1.8. He recently sold most of his lenses, so he is working with a few fixed lenses in his bag, renting others as needed. Current books on nightstand: After Photography by Fred Ritchin and The Ongoing Moment by Geoff Dyer. Favorite place to find inspiration in Pittsburgh: Walking the neighborhoods. It is his favorite way to explore any city. He plans to spend time exploring the West End next. One piece of advice that he would give to his youthful self: To be less arrogant. “I didn’t realize what it really took to run your own business. Money-wise, I mean.” After working with famous photographers in NYC, he was naïve about a photographer’s lifestyle and the income it took to get started. He thought he would just start working and catapult to the top of the field, unrealistic about the investment that it takes to get there. As a food lover, I always have to ask…Favorite Pittsburgh restaurant: Dish, Pittsburgh’s Southside (http://www.dishosteria.com/). “If I could have any kitchen, it would be Michele’s kitchen,” he proclaimed, referring to owner and friend Michele Savoia’s amazing kitchen and cuisine. To learn more about Richard Kelly, please visit his website at www.richardkelly.com, his Twitter feed at richardkellypho and his current work on Instagram under richardkellyphoto. It’s A Second In Life, But It’s Immortal. 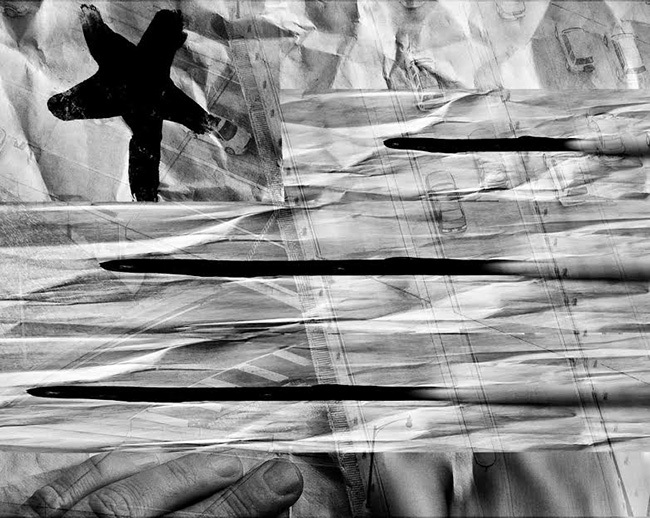 Recently, I had the pleasure of sitting down with René Karwowski, the B&W: A Look into Black and White Photography Best-of-Show winner for her photomontage entitled USA. We met up to talk about the show and her thoughts on photography. This vibrant, easy-going visionary reminded me of why many of us remain in awe of the photographic medium. As she observes, “It’s a second in life, but it’s immortal”. It’s a very sad story, actually. Well, it isn’t and it is. When I was younger, my father was a photographer, so I used to sit on the cellar steps and watch my dad develop film, and there was this whole awe about it. I was maybe 5 and I was literally dumbfounded about it all, watching him do all of this – a total crazy mad-man alchemist, dipping and moving and hanging. There was a romanticism about the film, and the whole entire process. I kind of fell in love with it then. So, my father was always into it and I became fascinated with it and I got into drawing & painting because I was young and didn’t have a camera. I knew I was very artistic. I come from a very artsy family – my dad was a musician and he was into photography, my mother would draw and she is also a ridiculously good interior designer, and my brother is a very talented jazz musician. I always wanted to work with film, but had no money and no access and I kept finding excuses. But then, and here comes the sad part, almost 7 years ago I had a friend that was murdered by her boyfriend. And I sat one day, going through a ridiculous amount of photos, just to find one of her and I. I found one, one tiny one. She was like a little sister to me, and all of a sudden I said ‘okay, I’m in’. I didn’t care how much it cost; I decided to finance a camera. I felt like I needed to find something beautiful left in the world, because it had been taken. And, I haven’t regretted it. I’m so sure that this is my medium. I am SO in love with photography. Let’s talk about the Black & White show. Congratulations on your Best-of-Show win! What did you think of the exhibit? Actually, it was my first show. I had a friend convince me that my stuff was good and that I needed to put it out there. So I entered, and honestly, I was totally amazed that they took all three of my photos. The Best-in-Show win was even more amazing. I’ve always just been shooting on my own and learning on my own, and having my dad give me tips here and there and saying, “Just shoot. Go shoot”. I’m literally just surprised about it all. Tell me about your piece USA. I had a photo in my head – this thing of smearing black ink, with an asymmetrical design, with hands, and we were watching the Olympics and a friend suggested the flag. And I thought ah, that’s genius, that’s brilliant. So I sat down and balled up an envelope and used ink and drew the star. I took two photos, one of the hand and another with the blur of me pulling the lines, so that I could cut and paste the stripes in Photoshop. It was literally three or four photos that I had layered on top of each other, so that I could keep the blur because everything is so vast in the United States, where we barely say hello and we’re running around like crazy people. And I added the calm of just the one star. Then, I had taken a photograph from the 44th floor of the USX building, down on traffic to get the cars and the symbolism of the United States. It just all came together. I like to play with images for hours and get them to a place where it’s right. I’m pretty happy with it! What equipment did you use? I have a D300 that I love and I shoot on a tri-pod with a self-timer. I was using one of my favorite lenses, the 105mm. I’m using Photoshop CS4, because I’m too poor to afford a new one. So, if anyone wants to donate, that would be great! (As we laugh), it’s the same thing with Lightroom. I insist on Lightroom, Lightroom is your darkroom. Photoshop is a playroom. You clearly enjoy working in the black and white realm. What advantages do you think black and white images can have over color photography? Oh, I do like black and white photography. Color photography is a great medium to express things, but I feel that in today’s society, with all of the technology that we are dealing with and the vast open space that we have to explore, I don’t think people look at a color photograph and give it the respect level that should be there. Plus, it has been abused with HDR and over-saturation, and I don’t think the general public even knows what a normal color image is anymore. When people see black and white photography, you either have the skill level or you don’t. You can’t really hide in black and white, and that brings out who you are as an artist. Who’s work has influenced you over time; where do you like to draw inspiration from? One of my favorite photographers is Lasse Hoile, he is a Danish photographer. This guy is super cool and doesn’t even use a SLR, he is old school pulling out Diana’s and Holga’s and Polaroid’s. I really have a lot of respect for him. He can be macabre and morbid, and I have a side to me that loves that stuff and I fall right into it. When it comes to pure inspiration, everything inspires me. I love to shoot anything and everything. Life is so mundane, but there are so many mundane beautiful things, if you take the time to look at them. That’s really what life is about. What do you still have left to learn; where do you want to grow as an artist? From figuring out how to frame and mat, to figuring out what my actual personal style is, I’m open to expanding in a different direction. I try not to put goals on myself in photography because I don’t want to limit myself. There is enough to learn in photography that you could become a jack-of-all-trades and a master at everything you do, depending upon how much time you put into it. In the end, what you stick with is what you truly become passionate about. I’m only 6 years in and that’s way to early to claim, ‘that’s who I need to be’, because then I am closing myself off to something else that I could end up being truly passionate about. This is where technology comes in, too. I’m so old school, I don’t have a Facebook account. I respect it for what it is, but at the same time I fear that it is going to take the simple beauty out of the skill. And, if that goes, I will be devastated. You need to know how to photograph first. Speaking of technology, is there anything that fascinates you about the current trends in photography? It’s interesting, and I’m fascinated by what’s there. But if you’re not manipulating ISO and aperture and shutter speed then you’re not doing photography. You are doing image creation, which is art and I’m clearly fascinated by that, but it isn’t quite photography. I love it, love what you can do with it, love the apps that you can play with, but at the same time, there is a feel to holding the camera, to manipulating everything in your hands, to using your mind to manipulate what you see, and you can’t really quite get that with the technology that we’re using with other stuff. I am torn about it. If you are not out photographing, what can we find you doing; what are your hobbies? I go to a job every day and I shoot. I get sad if I didn’t get to play with my camera. I’m always thinking about when I can get time with my camera. Photographers love a great place to nosh, what are your favorite Pittsburgh restaurants? I’m such a starving artist that I can’t even afford a car! That is why I live in Shadyside, because I can get anywhere. Sometimes I grab something to eat at Harris’ Grill. There’s Soba, and Noodlehead is now over on Highland. There are so many great restaurants around here. I actually don’t eat out too much though, because I am always trying to put more money aside to frame more photographs! But, this is a really cool neighborhood. There are very open-minded people here; it’s very diverse and everyone matters. Let’s leave with a bit of René wisdom; what is one thing that you wished you knew before starting down the path of photography? I would have told myself to finance a camera at (age) two. When I think about how long it took me, I lost a good fifteen to twenty years that I could have been doing what I clearly, truly love to do. If you want it, get it and do it! Photography is powerful. It’s a second in life, but it’s immortal. A recent post on the Plagiarism Today blog (http://www.plagiarismtoday.com/2013/11/26/goldieblox-three-beastie-boys/) sheds some important light on the current copyright standoff between little girl empowering toy manufacturer Goldie Blox (with a seemingly positive mission statement), and the 80s /90s hip hop band Beastie Boys. As is frequently the case in infringement claims the infringing party is shouting “fair use” from the rafters. While the advertising video for Goldie Blox is parody in style (using a Beastie Boy song), the video’s function is advertising to sell products. Its purpose is that of commercial gain. On the surface the infringement appears to be parody and therefore I understand supporters of Goldie Blox claiming fair use, but lets think about the intended function of parody in culture and why it can legitimately be claimed in some cases to fall under fair use. In an editorial or art function it is potentially about free speech. How can we have a discussion about social issues if we cannot use humor to investigate and engage information about the issues for communication purposes? If Goldie Blox truly wants to use parody as a foundation for an advertising campaign then they need to hire artists to create original content and pay to license that content, or pay more to own it outright. Then they can use the creative content however they want. Instead they have appropriated existing intellectual property without permission and are attempting to hide behind the fair use doctrine claiming parody in the context of advertising to boost revenue. Think of the consequences for independent artists if this type of reasoning was to become a legitimate fair use exemption. Corporations would be accelerating their exploitation of individual artists at an alarming rate. Steal original content, include anything that might hint at parody and have your army of legal counsel stand behind it on the basis of fair use. Bad news for artists indeed. But, perhaps the most troubling observation in Mr. Bailey’s blog post is the revelation that it is actually Goldie Blox that has initiated a pre-emptive lawsuit against the Beastie Boys, seeking a judicial statement that the video is protected by fair use. This is obviously some pre-meditated corporate strong-arm tactic subverting the intellectual property rights of artists via a rather dubious expansion of the fair use doctrine. Artists everywhere should make sure they understand what is taking place here and its potential impact on their IP rights. Interestingly, I cannot now find the referenced video online. Perhaps the backlash has already caused some reconsideration? Camera Arts Creative and The Alliance for Contemporary Photographic Learning invite you to an evening of conversation, concepts and images. Please come join us on Nov. 6th starting at 6:30pm. On the agenda for the evening: Keeping creative motivations thriving via personal projects: planning for them, researching them, how they can feed your commercial work / marketing, or just developing photo projects as a way to keep your personal artistic growth moving forward. Come share your thoughts, experiences, and questions on this topic. Feel free to bring some prints from completed projects or works in progress. Whether you are immersed in a large project or struggling through a creative block come and share / listen. Our intention is to establish a supportive creative environment where photographers can gather and exchange ideas, insights and inspiration. Step away from the computer, come out and spend some time with other visual artists. Arrive at 6:30pm, discussion starts at 7pm. Pittsburgh Pennsylvania. All photographers welcome.